Voluntary muscle controls movement. They contract and relax in order to allow movement of parts of the body like legs, hands etc. Sometimes a muscle or a few fibers of a muscle contract on their own. This is called spasm or cramps. Tizanidine helps to relax the muscle. Thus provide relief from muscle spasm and cramps. 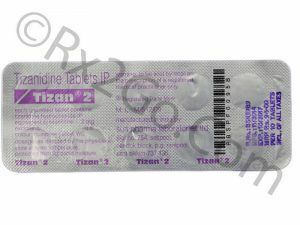 Tizanidine belongs to the class of medication called skeletal muscle relaxants. It blocks a certain natural chemical in the central nervous system. This blocks the nerve signals from the spine to the brain. The drug has a great effect on polysynaptic pathways. It blocks nerve impulses (pain sensations) that are sent to your brain. This slow down the action in the brain and nervous system to allow the muscle to relax. It relaxes muscle tone which is temporary. Tizanidine is available in the form of a pill of strength 2 mg and 6 mg. It is a short-acting medicine. You can see noticeable effect between 1 and 3 hours after you take it. Usual dose – 4 mg every 6 to 8 hours. Recommended dose – 8 mg every 6 to 8 hours. Your doctor may increase by 2-4 mg as needed every 6-8 hrs with or without food. Maximum dose – 36 mg in a day. Children – Not recommended for use in children. What are the uses of Tizanidine? Tizanidine helpful to manage spasticity. It is a short-acting muscle relaxer. It helps to relax muscles due to spasm, cramp e.t.c. Relax muscle that becomes tight due to medical problems such as multiple sclerosis or spine injury. It can be used for other purposes not listed in medication guide. What are the precautions in taking Tizanidine? Certain conditions need to take extra care. Consult your doctor if you have/are. Dental or any other surgery. Avoid use of heavy machinery, driving and other activities that need to be cautious. The drug may make you feel drowsy. Tell your doctor regarding all the medication you take. This will avoid the drug interaction. Decrease the dose of steps when you need to stop the medication. This will avoid withdrawal reactions. Cost of Tizanidine [Generic & Brand]. The generic and brand version of a medicine contains the very same active ingredient. Thus the effect is same. They differ in their price. Generic drugs are cheaper. The raw material for the drug is ordered in bulk. They don’t include expenditure like packaging, pricing, and advertising. Pack of 30 pills of 6 mg costs $ 35, per unit cost is $ 1.17. Cost of 30 pills of 2 mg costs $ 88.05, per unit cost is $ 2.94. • Pack of 30 pills of 6 mg costs $ 161.26, per unit cost is $ 5.38.